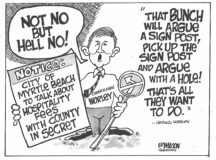 Post Tagged with: "county ordinance"
Horry County Council took the coward’s way out from making potentially controversial decisions when it passed third reading of a county road maintenance ordinance Tuesday night. In passing the ordinance, council shifted the decision making process to county staff on which roads currently maintained by the county should be removed from further maintenance with county tax dollars. The excuse is the county is maintaining some roads that are actually driveways or serve no public benefit. There’s no question taxpayer dollars should not be spent on private driveways or other roads that do not generally benefit county taxpayers. But what exactly is a public benefit? In the past, county council allowed private gates to restrict access to public roads in the Myrtle Trace sub-division. Those roads were paved and maintained by the county but restricted to use by sub-division residents only. When that issue was exposed in the media, Horry County Attorney John Weaver attempted to justify that it was perfectly legal to restrict access on public roads. Ultimately, Myrtle Trace residents agreed to remove the roads from the county system and maintain them privately. But, that decision only came after the roads were repaved with county tax dollars one more time. Council member Al Allen was correct in his criticism of county council being taken out of the decision to remove roads from county maintenance. It takes a majority vote of county council to accept roads into the county road maintenance system. Why should it take a decision of only a few members of staff to remove roads from that same system? Allen said the idea behind county staff making the determination of which roads to remove from the county road maintenance system was to take the politics out of the decision. 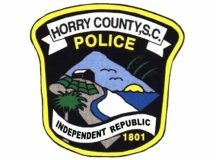 In a neatly orchestrated discussion to reach a predetermined conclusion, the Horry County Public Safety Committee determined an independent Horry County Police Department would remain the rule in the county. Said in a slightly different way, there will be no opportunity for the voters to express themselves through a referendum on whether to merge the police department with the Horry County Sheriff’s Department because council is unwilling to give them the opportunity. Horry County Attorney Arrigo Carotti told the committee it would require a three reading ordinance of council followed by a binding voter referendum to merge the departments. Carotti said the ordinance had to be passed by August 15, 2016 in order to appear on the November 2016 general election ballot. Carotti said there was only one meeting of Horry County Council before the August date and special called meetings of council were only intended to address urgent issues between council meetings. Obviously, there is no urgency on the part of council to allow the voters the opportunity to vote on the issue of a merger. Carotti said low voter turnout consistent with special elections, the other possible alternative for a referendum, would not give a fair representation of the wishes of voters on the issue. By that logic, there should not be any primary elections nor special elections for vacant offices because the wishes of the voters are not fairly represented by the 10 percent or less of voters who turn up at the polls to vote in them. You can see this is not an issue that council is willing to take to the voters and this little dog and pony show was carefully designed to avoid that possibility. The Horry County Public Safety Committee heard a proposed ordinance from Horry County Fire/Rescue Department to require private ambulance services to enter into franchise agreements with the county. The private ambulance services would be on call to Horry County, as needed, to supplement the county’s publicly owned and operated EMS units. According to Fire/Rescue Chief Fred Crosby, there are 28 private ambulance services operating within the county. Approximately five of those are certified by SCDHEC for emergency services. The remainder operate basically non-emergency transport services often contracted with nursing homes. The proposed ordinance would require all 28 private companies to enter into a franchise agreement with Horry County in order to remain in business within Horry County.